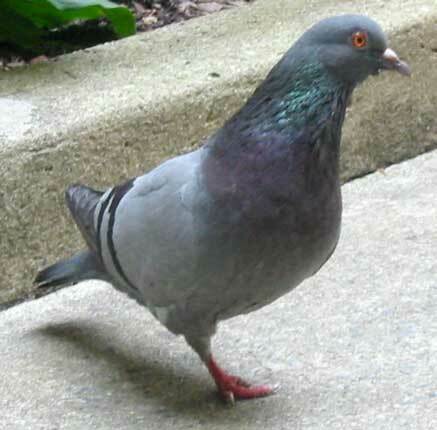 Have you ever seen a pigeon that has missing toes, a foot or even a missing leg? The chances are that the digits and/or foot were lost from string being wrapped around them. I can't think of anything more horrible than that happening to a bird. Imagine tying a rubber band around your finger as tightly as you can. You know what kind of pain there will be. You can take off the rubber band. The pigeon cannot take off the string. They can't walk up to anyone and ask for help. They suffer great pain and it can take over a year before the pain goes away along with the toe(s) or foot or leg. For me, this affliction represents the symbol of humanity's neglect of the natural world. String as thin as nylon thread to wrapping string is all discarded on the ground. 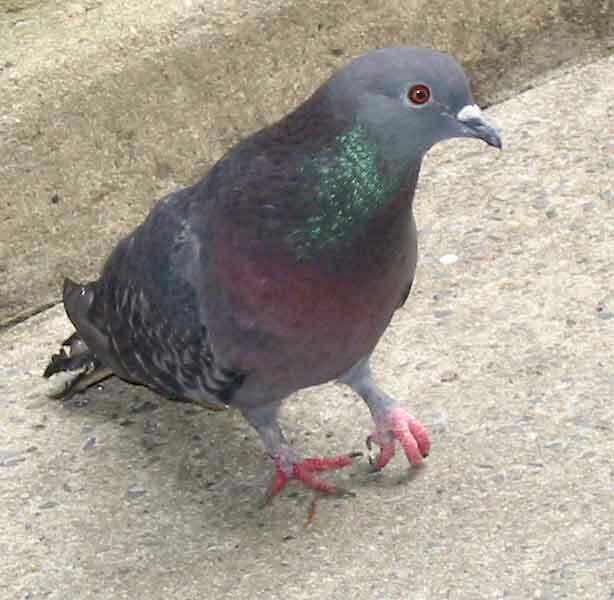 Pigeons walking on that ground will get it wrapped around their feet. The string curls and twirls around a toe or more digits and knots form. They begin to tighten and start to cut into the skin. When the string cuts though all the skin and muscle and tendons, it begins to tighten around the bone. A dry type of gangrene forms. The toe begins to die from lack of circulation. Lack of circulation can affect the toes and they begin to curl into a permanent contorted position. Eventually, the toe falls off or if the string is wrapped around the leg, that falls off. If anything falls off prematurely, the bird will bleed to death. Throughout this process, the bird is limping in pain and trying to compete for food with birds that can get to the source a lot faster. String can wrap around and tie both legs together so if you see a bird lying down on the ground and eating, that could very well be the cause. An injured bird will be far more reluctant to allow a person to approach within grabbing distance and that makes it much tough to get it. I have gone for more than a month trying to capture a bird with string wrapped around it. If you get one, the trouble is just beginning. 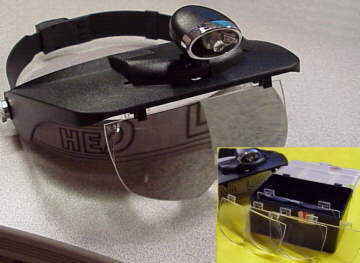 You need a pair of magnifying glasses even if your eyesight is good. You have to get as close as possible to the site to see what is going on. One wrong move and the bird can begin to bleed heavily. Pressure can stop the bleed but try to find the right point when you are working in blood and twisted contorted flesh that no longer resembles a foot. You need a good strong light similar to the tensor lamps. You need dental type picks and those can be purchased at a number of hardware stores. They have different tops and straight picks are not always the right ones to use. You need a good pair of small surgical scissors (Suture Removal Scissors are particually effective - see inset) and a good pair of tweezers. There has to be cotton, cotton swabs and something like Clotisol to try to stem any bleeding. Finally, you need Nolvasan or Betadyne to disinfect the area when you are done. If you use Betadyne, dilute it one part per ten of water. Nolvasan can be used full strength. All of this has to be available before even starting to work on the string. This is a puzzle wrapped in a maze. Its very important to follow the string as you unravel it so that you can definitely know that youre not leaving any residual. Pulling on the string up from one side is simply going to pull the string on the other side more deeply into the tissue so rather than pulling, it has to be unwrapped. The Suture Scissors slip nicely under thread and hair without causing undue pressure to the wound. Start from the bootm of the foot where it is flat. Once the Suture Scissors have caught a thread or several, snip them. Tweezers are used to unravel the string that can be wrapped around the inside of the wound a few times. When you hit a point where you can't unwind the string, you are at another knot and have to work with the dental pick again. If you can find other loose ends on the other side of the digit, unravel wherever you safely can and maybe you will get lucky and the string will be able to be pulled out in pieces but the correct protocol if it is at all possible unravel rather than cut the string into pieces. Incidentally, if you are working alone, one hand is holding the bird while you are trying to use your other hand to work with the tools. Wrap the bird up in a dark towel - with the head covered, on it's back. This will all but still the bird. The feet will twich occaisionaly. Don't be surprised if you find that as you unravel the string, it may follow all the way around the foot or ankle from places where you didn't even realize there were cuts. Sometimes all that is holding the toe to the body is the string and in taking the string off, the toe could come off with it. If there is still a blood supply, expect to apply heavy pressure to the stump constantly for possible up to 40 minutes in order to stop a major bleed. At this point, having Clotisol on hand is vital. If you are fortunate enough to get all the string off with no mishaps, your work is not finished. 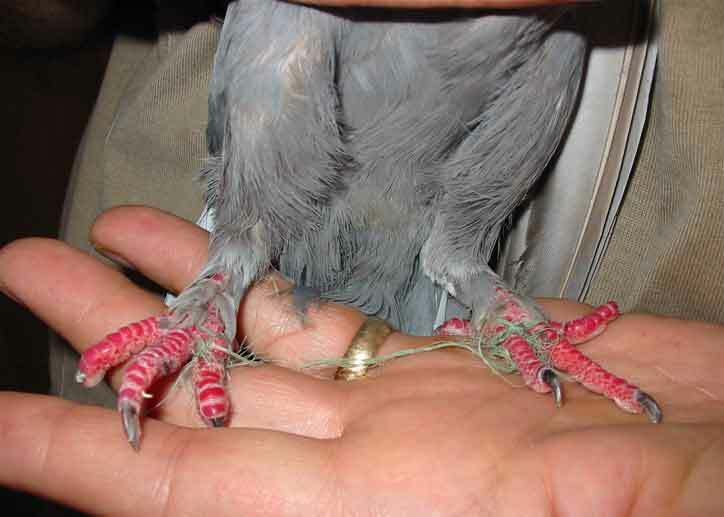 I once had a bird where the string was wrapped around an area above the foot and below the ankle (hock joint). That part of the leg was going to come off and if it came off too early, the bird would bleed to death. After the string was off, I fashioned a wire splint that wrapped around the bottom of the foot and taped to an area above the wound so the leg could not fall off until it was time. When it did, I kept the bird until it healed and then released it. He did very nicely for a few years. What do you do about the remaining toes that are curled from lack of circulation and the contracted ligaments and tendons? Trace an outline of the bottom of the foot and cut out a piece of plastic coffee can cover to match. Cut small notches in each piece for the toenails and place the fitted plastic on the bottom of the foot. Tape each toe to the plastic piece and tape the center of the foot to hold the entire device. You may have to stretch the toe in order to make it fit but that is the whole point. Straightening out the toes can take three weeks or longer but they have to be stretched or the toe nails can grow into the bottom of the foot and it is quite painful to walk on ones knuckles. Sometimes, if only the rear toe is curled, you can tape it to the leg in an attempt to straighten it out. Sometimes, if one toe is involved, there is no curling of the others but that toe can be dying from lack of circulation. 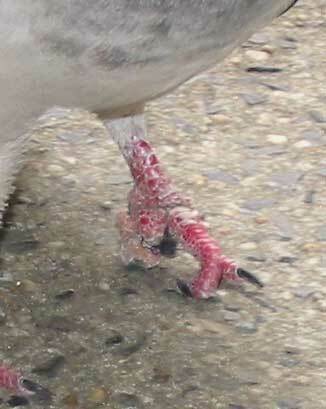 The toe dies from the top down so that if there is still circulation at the base and the bird accidentally hits the toe, it can break off prematurely and cause a major bleed. If I can release the bird save that one condition, what I do is cut off that part of the toe that is dead so that only a small stump remains and the bird can be safely released without my having to worry about another injury happening. If there is still circulation in the toe, I wait until it disappears and then cut with the surgical scissors. It's dead tissue and the nerves are gone so the bird feels nothing. There can be pus pockets in the foot or not. In any case, I give an antibiotic. It cannot be emphasized enough that you should seek a Veterianarian to remove anything that does not come off easily. See here for photo and video foot rescue and Case Histories from "Foot Squad"
Is there ever a situation where it is better to leave the string alone? Does it always get tighter and result in loss of circulation and toes/feet, or does it sometimes just reach a status quo, where it is just there? The fact that he grew into the string makes me wonder about that. He wasn't in obvious pain when we caught him. 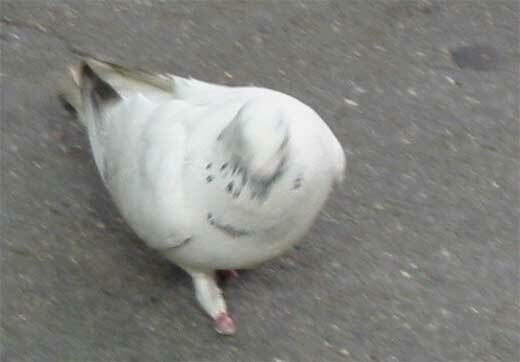 He was walking normally and competing for food like any other bird. He probably doesn't know what to make out of what's happening to him because he felt OK before (he was used to the string), but now he has some pain. I've seen a "Status quo" only a very few times and when I did, the string was around one toe. It didn't go anywhere and the bird was none the worse for it. That happens but it's very rare. I can't tell you what the bird was feeling all this time. Judging from the damage done, he was in a lot of pain for a long time. It's possible that the nerves are mostly dead and by the time you got him, he wasn't feeling much. What's left of the feet can be used as a base to walk on so the string had to come off. This was no status quo because there are some pockets of infection in both feet.